The trucking business is one of the most lucrative in many parts of the world. There will always be a constant need for truck drivers in any type of industry. In the state of California alone, the trucking business provides services for industries moving commodities such as produce, frozen food, groceries, furniture, building materials, automobiles, containers, livestock, restaurant supplies, and many other types of general freight. Due to the sensitivity of cargo and its significant value, it is best to protect trucking businesses with commercial truck insurance. On a regular basis, drivers face a lot of risks when transporting cargo from one point to another regardless of distance. If an accident arises it may result in injuries, delays, or excessive losses. Trucking insurance is mandatory in California, like all other states in America. It is necessary to adequately insure all trucks not only to comply with the state requirements but to ensure that they operate smoothly as well. Without any coverage, drivers will have to deal with hefty fines and penalties imposed by the state on commercial fleets. This hampers daily operations and creates significant financial setbacks the moment any truck becomes involved in an accident. 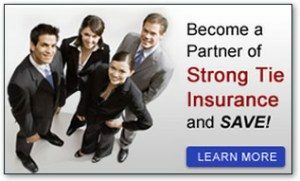 Before requesting a cheap truck insurance quote, which can be easily obtained at StrongTieInsurance.com, it is best to get familiar with the coverages. With motor truck cargo insurance, the freight carried and the potential costs for its loss or damage will be covered. During transit, a vehicle may become involved in a collision, fire, or accident and this may damage the cargo. As a trucking business owner, one may also have to pay for the medical expenses of the driver, his passengers, and other third parties involved. The trucking business owner will also have to deal with other costs such as legal expenses and compensation for the lost or damaged goods on top of the damage to the vehicle. By having motor truck cargo insurance, the trucking business owner will be protected from these unexpected costs. A comprehensive insurance policy provides this kind of protection that is needed when operating in the trucking business. With that in mind, as a trucking business owner, one can also enhance their coverage by adding other coverages such as Excess Liability Coverage and Trucking Workers Compensation. In extraordinary circumstances, while transporting cargo and the fleet encounters a catastrophic accident, Excess Liability Coverage provides the added protection that is beyond the standard limits of a truck insurance policy. In situations like this, it is important to provide protection for drivers and employees from extraordinary risk. With Trucking Workers Compensation, employees are protected if they experience a collision or any unfortunate accidents like falls or slips during disembarking of cargo or in the warehouse. Trucking Workers Compensation will cover the driver’s medical costs and their lost wages.